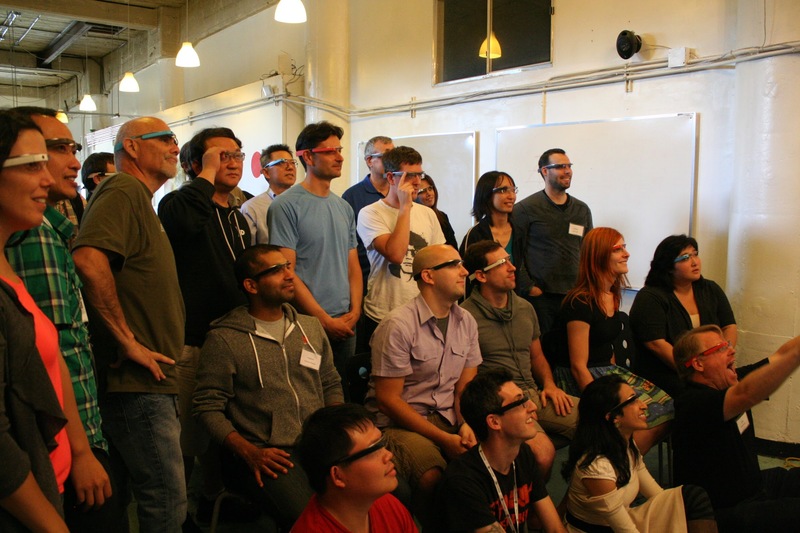 From Friday to Sunday in the SOMA district of San Francisco, techie workspace rental firm Citizen Space hosted a Google Glass Hackathon. The event held there turned out to be the largest gathering of Glass Explorers (the name Google gives those who have purchased Glass) to date,. some 30 or so Glass-wearing futurists donated their hardware to the competition. They were joined by developers for the three-day competition, and together the group turned out an impressive 17 unique apps for businesses and consumers alike. 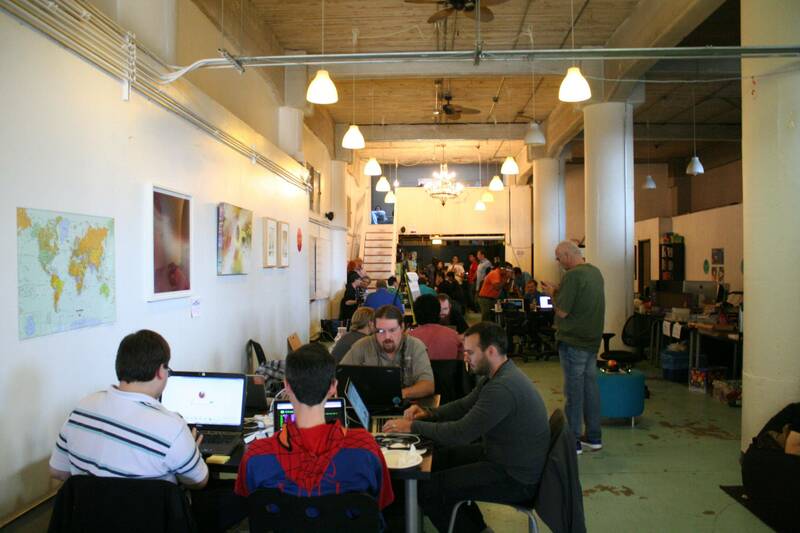 The victors of the three-day hackathon were an ingenious team that made Frogger for Glass. Their winning app incorporated Glass’ accelerometer, which turned your physical movement into the game controls. Hopping moves your frog forward across the road in Frogger Glass. A programming choice that wowed the audience during final presentations and had them downloading the app afterwards. Second place went to Plant Something, an augmented reality app which allows you and other Glass wearers to grow virtual plants at real locations. Third place went to Connected Glass, which was a platform that allowed developers to create peer to peer connectivity with Glass and your other mobile devices so you could control Glass through your smartwatch or smartphone. Even though they didn’t take away a prize, there were other teams that were equally impressive. Standouts included Vitals on Glass, whose team brought to the drawing board one of the more ambitious and marketable apps with a medical hack. The Vitals on Glass app displays vital signs data from surgical patients wearing a ViSi mobile wireless monitor to a surgeon wearing Glass.This fully operational software taps into the fast-growing remote and wireless patient monitoring market, which is expected to double by 2016. The second standout of the weekend was Powercast, a hack for displaying and controlling PowerPoint presentations using Glass and Google’s new $35 Chromecast device. Darshan Shankar presented his final version of Powercast, and the results were stunning: Shankar showed how he could view a Powerpoint on his Glass or on an external monitor or screen with a Chromecast inserted into it, as well as move around the slides by swiping his Glass or wirelessly-connected smartphone. The problem with this? Chromecast’s SDK is still in Beta and developers aren’t supposed to be hacking it just yet. Shankar’s chances of winning may have been hindered because he created a hack that he can’t go out and market yet. Still, he explained it was only a matter of time before the ban was lifted and he could spread Powercast to the Glass masses. And that seemed to be a key deciding factor at the hackathon. The winning hacks were not only fully operational and utilized more parts of Glass than just the display, but were also immediately accessible. Glass Frogger already has a website up and running for people to download the game on Glass and other mobile devices. So while the future was on display, the future that was immediately accessible was rewarded. While Frogger stole the show, Vitals and Powercast do show immense promise in bringing Glass to industries as a tool when it becomes available next year. While Google wants Glass to revolutionize consumer tech, it’s hard to imagine non-early adopters to latch onto such futurism. Reports of it being goofy looking and an intrusion of privacy make it a hard sell. However industries are jumping onto the Glass developer bandwagon. Glass wouldn’t be the first consumer marketing tech to find more love in business. Microsoft’s Kinect had a lukewarm reception among gamers, but has become popular outside of that world: whether it’s to turn it into a 3d scanner, to train a robot to be a jedi, or improve a nuclear power plant’s safety. In fact the healthcare field was one of the first to jump onto the Kinect bandwagon, something that we’re seeing with Glass. Vitals on Glass isn’t the only team who thinks Glass could have a future saving lives, and certainly won’t be the last. And Powercast is tapping into a predicted trend of hands-free tech in the workplace. Even if the general public balks at Glass, hackathons and industries will bring it to the forefront of the future as a cutting edge tool. Which means someday soon you may have the pleasure of downloading the One-X app for Glass.